There were some good moments in this movie, but in the end it just made me feel empty and sad...we just watched it a couple weeks back...too stark...and really...hopeless. I've never heard of this one....looking for it, now. And sometimes life in eastern Montana IS stark and sad. It's such a place of extremes and it's very hard at times. Angh ... yeah, definitely one of the saddest and bleakest movies I've seen, about Montana or anywhere. But life's that way sometimes, even though it's stuff we don't like to dwell on. And the filmmakers definitely have a feel for Montana (they're from Missoula). Don't forget Sam Shepard's "Don't Come Knocking." This film, partly set/filmed in Butte, is definitely worth seeing and is filled with remarkable views of Butte. Made me homesick! One of my favorite musicians, Jay Farrar, scored the soundtrack. It's pretty good listening on its own. Vic Chesnutt, Ryan Adams, Uncle Tupelo, Pernice Brothers, Neko Case, Jimmie Dale Gilmore. It's not bleak like the movie. Great for roadtrips. Really enjoying this blog, btw. I used to live in Montana and try to get back as much as possible. @Pat: I enjoyed watching "Don't Come Knocking," but it was definitely a mixed bag. I thought the script needed a lot of work, but the cinematography was really amazing. Poor old Butte never looked so good! 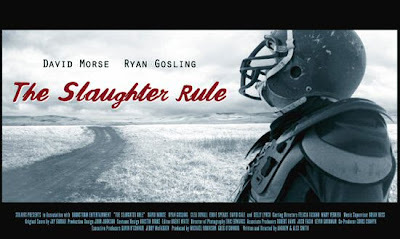 And yes, the "Slaughter Rule" soundtrack is really well done. As you said, by itself the soundtrack doesn't have the bleakness of the film ... but somehow it still fits, and its very evocative of rural Montana. Very glad you're enjoying the blog!